You are receiving this e-mail because you have a child entering 7th grade at a Yeshiva Day School in Bergen County. As we cobbled together e-mail addresses from various sources which are certainly incomplete, please forward this to others who may be interested. Allow us to introduce ourselves. My name is Gershon Distenfeld and for the past several years, I have been heavily involved in efforts to make Yeshiva education better and more affordable. 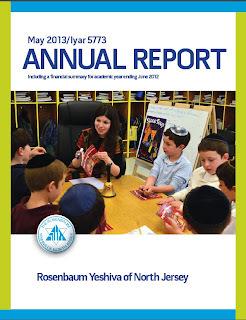 I have previously served on the executive board of the Rosenbaum Yeshiva of North Jersey and am currently the chairman of the board of Yeshivat He’Atid. If anyone wants to take another crack at starting up a Hebrew language charter school in Bergen County they should work with the Hebrew Charter School Center. Take a look at the extremely thorough job they did with this report filed to get the Harlem Hebrew school up an running: http://www.p12.nysed.gov/psc/documents/HHLACSAppRedacted.pdf. 243 pages of information, which is 243 pages more than SACS ever provided. HH is expecting at least 168 students in just 2 grades (K&1) in their first year! And 20 more days of school than most of the BC yeshivas. You have to give credit to BPY for not caving in to pressure from the new competition and slashing pre-school prices as the other schools did. But you have to wonder whether this is going to impact the sustainability of the school. The reduced pre-k enrollment for this coming year could hurt them in the future if parents send to other schools to save money in pre-K & then keep them in the other schools by default in later years. They may try to make up for high prices with generous tuition assistance but they have to take into account that a lot of upper middle class families don't want to subject themselves to the tuition assistance program, and don't want to feel that they are accepting charity. The calendars for next year are out. Not surprisingly, He'atid once again leads the pack in total school days with 178. Though for some reason He'atid clone Westchester Torah Academy has only 172. I still think we should have as many days as the public schools, which have 180. We can make up for the chagim by adding days in June. He'atid is having Professional Development day on Christmas, rather than on election day as most schools do (except this past year, when we needed to make up days lost to superstorm Sandy). So I guess the consultants are all Jewish & don't mind working then. I'm a little concerned about Thanksgiving break being called Thanksgiving/Channukah break. Does that mean that when Channukah & Thanksgiving are on different days that they will need 2 separate breaks?